Chris McNulty reports from Scarvey. Picture by Herbie Barr. Donegal are Buncrana Cup kings again as Declan Bonner's charges held on for a nervous win over Tyrone in Saturday's final at The Scarvey. A first-half penalty by Stephen McBrearty and a crucial second goal by sub Gavin McBride delivered the prized silverware to Donegal for the first time since Patrick McBrearty led the class of 2008 to glory. Donegal were made fight all the way for the win by a polished Tyrone side who couldn't make the most of the possession they had in the second-half. Playing with the aid of the stiff Buncrana breeze, the Red Hands boys could only muster three points in the second period. 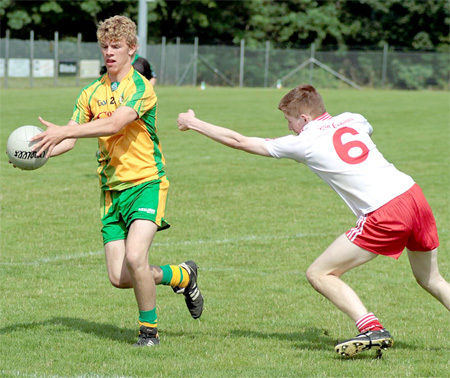 Having scored 6-09 in their semi-final win over Derry in Muff, Tyrone came into the game with a big reputation - and a goal with the final kick of the first-half by Jonah Lafferty of Urney looked like teeing them up for the win. But Gaoth Dobhair's McGinley got Donegal's second goal eight minutes from the end and they managed to hold onto their lot in the nervy final stages. Donegal showed just one change from the side which beat Monaghan a couple of hours earlier in Burt with Kevin McGettigan replacing Georgie Kelly. It was Tyrone who shot from the traps and when they posted a 1-5 to 0-3 advantage with 17 minutes gone Donegal's game looked up. Kieran Hughes, Jonah Lafferty and the lively Conor McKenna hit early points as Tyrone took an early command. Donegal shot back and by the 15th minute were within a point. Although Gavin Slaine hit a free for Tyrone, Donegal landed scores from Michael Miller, Daragh Black and John McDyre. But it was Tyrone who propelled ahead. The bustling figure of Hughes cut a swathe up the right flank. After he got the better of Darren Gallagher, he slid into Macauley Quinn. The unmarked Quinn could scarcely believe the time afforded to him as he struck a crisp finish past Paddt Byrne. A free from Slaine pushed the margin out to five and Donegal were struggling. However, in the final seven minutes of the half they inched back into it. Black fired over twice before Donegal got themselves a lifeline as Stephen McBrearty tucked home a penalty, awarded for a foul on Cian Mulligan following good work by the duo in the lead-up. The goal levelled things up and Donegal were ahead for the first time when Niall Harley registered after some quick thinking by Eoin 'Ban' Gallagher. Disaster struck in stoppage time. Midfielders Quinn and McKenna were allowed much too much freedom as they worked the ball into dangerous territory - and McKenna off-loaded to Lafferty who made no mistake to send his side in two ahead at the break (2-5 to 1-6). Hughes put three between them early in the second-half, but Tyrone were reduced to 14 men then at a crucial period of the game - and Donegal sensed blood from here. Points by Gavin McBride and Oran Molloy had brought Donegal back to within a point by then - and eight minutes from time they were slap bang in the contest again. Again Mulligan had a big part to play. He knifed his way into the heart of the Tyrone rearguard before releasing to his Gaoth Dobhair club-mate McBride - and the big substitute found the net, though Tyrone 'keeper Conor McAnenley won't be rushing to see a replay of the goal. The onslaught came with Tyrone landing points from Hughes and Johnny Connolly - whose effort was well tipped over the crossbar by Paddy Byrne in the Donegal goal. However, in between times captain Stephen McBrearty stepped forth to keep his cool under the heat of a late, late free.McBrearty arched over and soon he was accepting the Cup as Donegal held on, with Tyrone cursing referee Eugene McDonagh after having strong claims for a penalty waved away late on. Paddy Byrne; Danny Monagle, Colm Kelly, Darren Gallagher; Christian Bonner, Niall Friel, Conor Morrison; Tony McClenaghan, John McDyre (0-1); Kevin McGettigan, Eoin 'Ban' Gallagher, Michael Miller (0-1); Daragh Black (0-3, 2f), Stephen McBrearty (1-1, 1-0pen, 1f), Cian Mulligan. Substitutes: Niall Harley (0-1) for McDyre (19 mins); Lorcan Connors for Miller (19 mins); David Tyrell for Bonner (20 mins); Oran Molloy (0-1) for Morrison (28 mins); Gavin McBride (1-1) for Connors (31 mins); Georgie Kelly for Tyrell (41 mins); David Sweeney for Molloy (46 mins); Conal O'Boyle for D.Gallagher (46 mins). McAnenley; Rhys Quinn, Seamus Warnock, Niall Kelly; Johnny Connolly (0-1), Tiarnan McNamee, Kevin Coney; Conor McKenna (0-1), Macauley Quinn (1-0); Ryan Bradley, Kieran Hughes (0-3, 1f), Patrick O'Neill; Gavin Slaine (0-2, 2f), Jonah Lafferty (1-1), Lee Brennan.